Curb Exchange is a free audio and print walking tour! 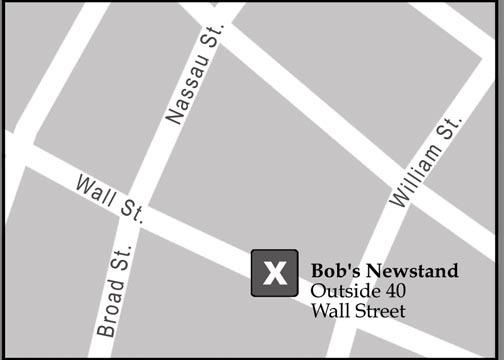 The tour starts at the newsstand outside 40 Wall Street between Broad and William Streets (see map below). Before the day of the tour, make sure you download the 8 audio files from this website onto your mobile music player. If you are joining a tour hosted by its creator, A.E. Souzis, you will be given a copy of the newspaper Curb Exchange and a map before you start. If you are taking the tour on your own time, you can download the PDF of the Curb Exchange newspaper or visit the People’s Library in Zuccotti Park (as of November 13, 2011) for a free copy with the map.